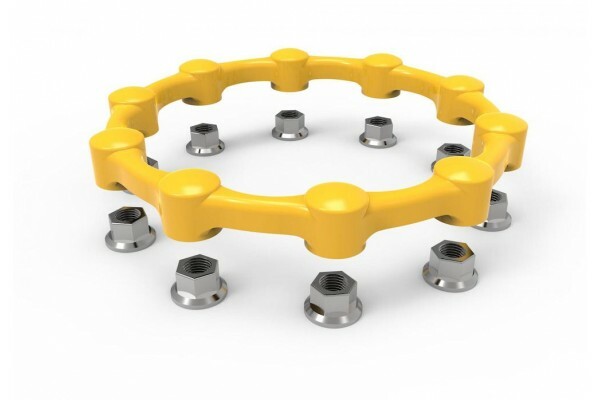 The Safewheel Wheel Nut Retainer (EU-Specification wheel PCD) from Checkpoint Safety is one of the more recent additions to the comprehensive range of wheel nut safety products. This product is specially moulded to sit on a set of wheel nuts on a commercial vehicle. Comprising of separate protective nut caps moulded together to protect and retain the vehicles’ wheel nuts. The Safewheel wheel nut safety solution is one that not only improves the integrity of your vehicle by incorporating various safety functions, but also provides protection to pedestrians, cyclists and other road users from protruding wheel nuts. The Safewheel is reusable, simple to use and very durable, looking very professional on commercial vehicles. Available in a wide range of sizes, the Safewheel aims to cover a wide range of applications throughout the commercial vehicle sector. The Safewheel design is intended for wheels without trims/step rings. In circumstances where trims/step rings are in place, the Dustite LR® indicators are more suitable. Once the wheel nuts have been tightened to the manufacturers recommendations, the Safewheel can then be fitted. Not to be used as a direct replacement for a safe, sound vehicle wheel maintenance schedule and should be fitted in accordance with the product guidelines, used in conjunction with a robust system of wheel safety checks. The material used to manufacture the Safewheel is a robust but lightweight polymer that produces the ideal characteristics such as elongation and stiffness best suited to the intended application. The Safewheel has a vast working temperature of -40˚C to +120˚C and is also UV stable, highly resistant to grease, salt and other roadside chemicals. If you have any doubts regarding sizing and product availability or specification, please get as much information as possible and then contact us for assistance in establishing the correct Safewheel™ for your application. The standard* colours for all Safewheel™ sizes are Yellow, Red, Graphite, Orange and Grey however subject to a high minimum order quantity, other colours may be available. Safewheel™ 'Twin' is available in Grey, Yellow, Red and Blue.